One who does all work as an offering to the Lord, abandoning attachment to the results, is as untouched by sin (or Karmic reaction) as a lotus leaf is untouched by water. (5.10). Thus Lotus is a symbol of purity and enlightenment amid ignorance (the smutty swamps in which it grows). Lotus in spite of being in water never gets wet. It is not bothered about its surrounding but it blooms and performs its job and vanishes. The ultimate aim of living beings is to perform its karma without bothering about the external factors. 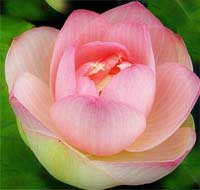 In Hinduism, Lotus represents the concept of primordial birth from the cosmic waters of creation. Lord Brahma emerging from the navel of Lord Vishnu symbolically represents that life begins in water. 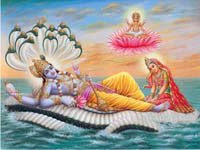 Lord Vishnu represents that force which is responsible for all living and non-living. It also symbolically suggests that all living and non living are connected to the ultimate source through an invisible thread but we unfortunately don’t realize it. Numerous gods and goddess in Hindu pantheon are depicted as sitting on the lotus or carrying it. The ultimate aim of each human being is to be the lotus flower – perform the Dharma without being attached to the world.